Add Your Events To The Calendar! This is my annual request for everyone to add all of your local events to the calendar here. Events in the calendar always get more entries, so the sooner you can get your event on the calendar the better. Of course it's good to have really complete information but you can add an event as soon as you have firm dates, contact information, and location. The person who creates an event can come back later and edit it. If you have an local group with a lot of events (lucky you!) please get one volunteer to add all the events so there is someone responsible for maintaining them and events don't get added twice. The calendar is looking much better! Thanks to all the groups that have added their 2019 events. 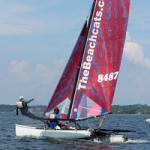 I know there are plenty more out there, please request your club to add all of your catamaran related events to the calendar to get that exposure. Events on the calendar consistently get more entries! Hey PopEyes7! Good to hear from you. Thanks for adding to the event calendar.